Boris Johnson has been urged by the heads of both branches of the legal profession to call for the release of a Briton who was abducted in Yemen and is now on death row in Ethiopia. 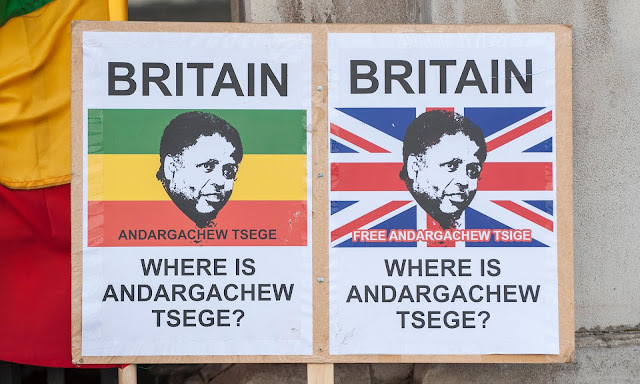 The president of the Law Society, Joe Egan, and the chair of the Bar Council, Andrew Langdon QC, have written to the foreign secretary to ask him to intervene more forcefully in the case of Andargachew Tsege. Johnson has said he will “not interfere in the legal systems of other countries” and that calling for his release would not “be helpful at this stage”. Tsege, known as Andy, was kidnapped in 2014 and forcibly flown to the Ethiopian capital, Addis Ababa, and is an opponent of the regime. He holds British citizenship. His partner, Yemi Hailemariam, and their three children are also British and live in the UK. She has not spoken to him for nearly three years. Tsege, 63, had previously been secretary general of Ginbot 7, a political opposition party that called for democracy, free elections and civil rights in Ethiopia. He first came to the UK in 1979. Tesge was travelling from Dubai to Eritrea in June 2014 when his flight stopped over in Yemen. It is believed Yemeni security staff handed him over to the Ethiopians. The letter to Johnson from Egan and Langdon says they are very concerned about the situation of Tsege, who is “unlawfully detained on death row”. It points out that he was tried in absentia, without notice and sentenced to death in 2009. Maya Foa, the director of Reprieve, which is campaigning for Tsege’s freedom, said: “[He] has suffered extreme abuses at the hands of the Ethiopian government, from kidnap to torture to an unlawful death sentence imposed for his political views while he was living with his family in London. In a public letter to the foreign secretary earlier this year, two former justice secretaries and a former DPP – Dominic Grieve QC, Lord Falconer QC and Lord Macdonald QC – also urged Johnson to call for Tsege’s “immediate release” in “the light of the international law violations”. In an open letter published in August on the Foreign Office website, Johnson said he had raised Tsege’s case with the Ethiopian government on numerous occasions. He added: “Britain does not interfere in the legal systems of other countries by challenging convictions any more than we would accept interference in our judicial system.